On this page are listings for Bible software for Windows, Mac, iPhone and Android. These software packages are free complete Bible software with study guides and additional add ins. This is not Bible software it's self but I believe it is important for all parents to use some kind of web censor software to protect their children for content on the web that they should not see. Unfortunately the web just like society its self has a darker side that children should not see. K9 has put out some awesome web protection software to help parents prevent their kids from access to this inappropriate content. They have version for all platforms including Windows, Mac, IOS and Android. Their website can be found at this link K9 Software. Jesus told us that since we've been blessed we should bless others. I am happy to provide a blessing to others in the form of free Bible study software! As a Bible student and teacher I have experienced the necessary work involved in searching the Scriptures for the competent preparation of a Bible study, Sunday school lesson, or a sermon. There are volumes of books available as study tools (and the Christian community is indebted to the various authors' perseverance and scholarship), but there is not enough time, money, or shelf space to properly take advantage of these resources. Computer software has changed the way we can study the Word of GOD. With a simple search or click of the mouse button, we now have access to these same volumes of scholarship within seconds! Tired of waiting for the program to follow you? Afraid of trying out new things? Not any more! Tailor the software to your liking. Rearrange everything, configure every little detail to your heart's liking. Unless you try it, you will not believe that free software can be of such quality. No catches, no ads, no nags, no registration, not even your e-mail to download. Add notes to verses, chapters, whole Bible books or create you own personal hierarchical books. Highlight your favorite Bible passages. Edit, print, share you own modules. Expand your library with many add-on modules, most of which would cost hundreds of dollars to buy. With its elegant interface and ingenious organization, Bible Explorer makes it easy to immerse yourself in the study of God's Word right out of the box! No other Bible software provides this remarkable depth of discoveries with such clutter-free convenience! Over 4 million people on 6 continents use ‘The Bible Study App’ to read and study God’ word! More than just an e-reader, ‘The Bible Study App’ links your Bible reading with outstanding commentaries, maps, and dictionaries for an in-depth study experience. You can take notes, highlight verses, bookmark passages, and sync all of these things between different devices. Install now to explore over 100 free downloadable resources that make ‘The Bible Study App’ a must have. The split-screen view allows you to open two books at once to compare Bible translations, view your study notes while you read, or follow along with a commentary while you study Scripture. Remove distractions by opening your books and Bibles in full-screen and immerse yourself in the text. * Set your Bible App’s interface for your choice of more than 35 languages. * Easily select from hundreds of Bible versions, in over 200 languages. * Choose from popular versions like the NIV, NASB, ESV, NKJV, NLT, KJV, The Message, and more. * Offline Bibles: Read even without network access. * Hundreds of reading plans: Devotionals, topical plans, portions of the Bible, or the whole thing. * Many reading plans are even available in multiple languages. * You’ll find devotionals, as well as plans that lead you through specific topics, portions of the Bible, or even the entire Bible. * Search the Bible using keywords. * Highlight with custom colors—just like a paper Bible. * Share verses with friends using social networks, email, or SMS (text). * Bookmark passages: Share, memorize, or just keep track of your favorites. * Add notes to passages: Keep them private so only you can see them, or make them public to share with friends. * With a free YouVersion account, see all of your notes, highlights, bookmarks, and reading plans on any supported device. * Read easier with settings like fonts, text size, and contrast for bright or low-light conditions. * The Bible App requests access to your phone calls in order to pause audio playback if you're listening to a Bible when a phone call comes in. * The Bible App requests read/write access to your SD card because that's where Bibles are downloaded and stored if you choose to do so. * The Bible App requests access to your account list to help the signup process go more smoothly. If you choose to sign up with an account connected to your device, you can skip the verify step. * Contact support from directly inside the Bible App. Download the world’s #1 Bible App now and enjoy the Bible reading experience loved by millions! This Free iPhone Bible app, Free Android Bible app, and Free Kindle Bible app for kids is a media-rich experience that helps bring the Bible to life with videos and images from the Emmy nominated SUPERBOOK animation series as well as engaging interactive games. All content is embedded within scripture, so children can easily interact with it from within the context of the Bible. This app also includes profiles of people, places and artifacts from the Bible as well as providing Biblical answers to questions that are common to kids. • A complete collection of your notes, favorite verses and personal photos can be accessed from the My Stuff area of the app. • The SUPERBOOK Bible app includes multiple Bible versions plus audio for the New Living Translation. • A search function that will allow you to search the Bible or to search features within the Bible. 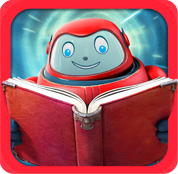 So download the SUPERBOOK Kids Bible App for the iPhone, the Kids Bible App for Android, or the Kids Bible App for the Kindle and Kindle Fire and get ready to start the adventure of a lifetime!